Early British generals faced serious challenges in delivering and storing sufficient provisions for 18th century British soldiers and colonial militia. This analysis investigates the influence of developed road systems that facilitated delivery of provisions and resulted in distinctive dietary patterning. The comparison of faunal data from forts located on major road systems with frontier garrisons and associated Native American villages like Fort Shirley and Aughwick Old Town, a short-lived (1754–1756) French and Indian War frontier fortification in central Pennsylvania, indicates a significantly reduced reliance on domestic livestock at these more inaccessible locations. These results suggest that road infrastructure heavily influenced military provisioning, encouraged adaptation to frontier living through reliance on wild game, and resulted in varied dietary practices at military installations in eastern North America. The logistics of supply delivery are one of the primary challenges to sustaining any military campaign. Extensive documentary and archaeological research has been devoted to military provisioning practices in the Roman Army, and later 16th–19th Century English, French, Spanish, and American armies in Europe, and both eastern and southwestern North America (Crass and Wallsmith 1992; Cubbison 2010; King 1984; Parker 1970; Pippen 2010; Poirier 1976; Rogers, Bartholomew & Armstrong 1998). These analyses indicate a widespread reliance on domestic crops and livestock which could be produced or purchased in large enough quantities to provision armies and garrisons and highlight the use of local sources in provisioning (Cubbison 2010; King 1984; Parker 1970; Tokar 1999). In addition to this literature, many variables are known to influence dietary patterning, including local ecological conditions (Martin 1991), status of site occupants (Mudar 1978), site function and access to roads, rivers, or other forms of infrastructure involved in transporting and delivering supplies (Jones and Gabe 2015; Martin 1991; Scott 1985; Scott 2008), urbanization (Albarella 2005; King 1984; Landon 1996), and even relations with indigenous populations (Breitburg 1983). The effects of these conditions are often difficult to measure from archaeological materials (see Jones and Gabe 2015). Many European officers recognized that conditions in North America would challenge standard military procedures (Beattie 1986; Parker 1970). Among these were the lack of established sources of the domestic crops and livestock which formed the basis of highly-standardized 18th Century European military diets, and the lack of established road and river routes to transport these goods in the frontier regions where many campaigns were conducted. The many failures of military supply systems in North America are documented in daily logs and correspondence (Breitburg 1983; Forbes 1758a; Parker 1970; Wainwright 1965). One of these is documented in the correspondence between George Croghan, the captain in charge of Fort Shirley, and James Hamilton of the Pennsylvania Colonial Government dated to 1755 which suggests that delivery of supplies to Fort Shirley and other frontier fortifications was irregular and unreliable (Wainwright 1965). In this paper, we investigate the uniformity of French and Indian War (1754–1763) soldiers’ diets, and assess the influence of local infrastructure in provisioning frontier forts. To accomplish this analysis, the animal bone assemblage recovered from recent excavations at Fort Shirley, a French and Indian War frontier fort on the Aughwick creek in central Pennsylvania, is compared to published datasets from ten other French and Indian War fortifications in Pennsylvania, West Virginia, Maryland, Michigan, Quebec, and Tennessee. Where rivers, roads, and local suppliers were available, standardized provisioning likely resulted in the domesticate-based diets described in historic documents. However, frontier fortifications were also erected in areas lacking these key components. 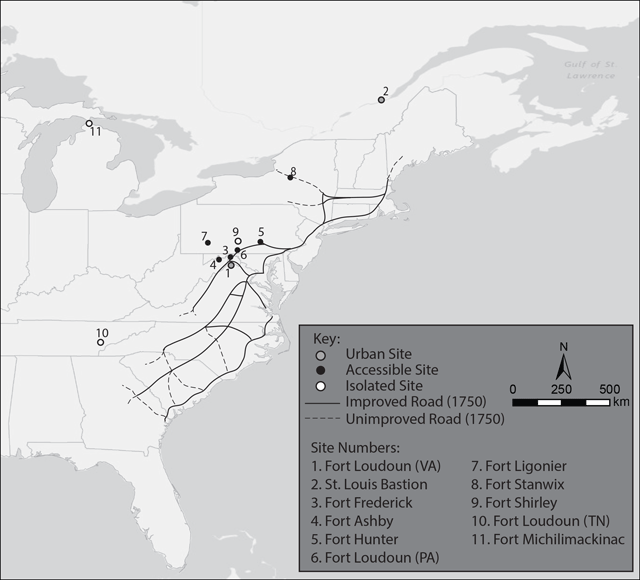 We hypothesize that comparison of faunal data from frontier fortifications like Fort Shirley, which was located far from established European communities and predated the development of road systems in the area, with those associated with road systems and urban centers will reveal significant differences in individual sites’ access to, and reliance on, standard military provisions (Sullivan 1997). In doing so we examine if 1) successful provisioning resulted in similar dietary patterns dominated by domestic cattle and pigs; and 2) poorly developed local infrastructure or a site’s isolation resulted in significant variation from this dietary pattern. Comparison of dietary data at French and Indian War fortifications in North America provides a powerful case study for investigating the effects of local infrastructure on soldiers’ subsistence practices for several reasons. First, the formalized nature of 18th century soldier’s daily rations provides a framework from which testable hypotheses regarding what should and should not appear in soldier’s diets may be developed. Second, the abundance of excavated military fortifications dating to this period provides the data necessary to testing these hypotheses through direct comparison of contemporaneous assemblages reflecting relatively short occupations. Finally, because many sites employed in this analysis were involved in General Forbes’ 1758 campaign to dislodge the French from Fort Duquesne, and relied upon a road network constructed for this campaign, they record the ability relative ease with which supplies could be delivered at different stages of this systems construction. In the 17th and 18th centuries, armies in Europe were provisioned through a combination of government victualling, private contracts, contribution quota imposed on local populations, and foraging (Antony 1972; Bannerman 2004). Movement towards larger, globally dispersed, and professional, European armies required to defend colonial empires in the 17th and 18th centuries necessitated alterations in the manner in which provisions were collected and distributed. In Britain this was especially true after the establishment of the New Model Army in 1645, though practices continued to evolve throughout the 17th and 18th centuries as Britain fielded increasingly large armies in Europe continent and North America (Bannerman 2004; Parker 1970). Provisioning 18th century British armies in Europe followed an established system. Responsibility for provisioning the navy and armies aboard ships was handled by the Victualling Board, while provisions for the army were handled by the British Treasury. Both of these entities issued contracts for necessary provisions and equipment to private contractors (Bannerman 2004). Contractors were required to ensure that a six-month supply of food stuffs and other equipment was on hand at permanent fortifications at all times (Bannerman 2004). The British government took responsibility for constructing infrastructure including roads and suitable storage facilities or magazines needed for delivering and storing provisions (Bannerman 2004). While on the march, provisions for soldiers were purchased along with wagons or packhorses for transport from local suppliers or middle men by sutlers, quartermasters, or commissaries, and paid with funds deducted from soldier’s pay (Bannerman 2004; Cubbison 2010; Parker 1970). Colonial militia were provisioned by their respective colonial assemblies, except when mustered into armies with British regulars at which time rations were provided by the British Treasury (Anderson 1984). Supplies provided to colonial regiments by their respective colonial governments usually resembled those of British regulars (Knox 1769), but at times, may have been more generous (Anderson 1984). Officers and enlisted men were provided with the same quantities and types of rations, though officers had the monetary means to supplement their diet and introduce more variety (Antony 1972). Calculations based on 18th century military manuals indicate that a single day’s rations for one man (Table 1) totaled between 2,400 and 3,100 calories (Cubbison 2010). An 18th century soldier’s daily ration in the British Army (Beattie 1986; Knox 1769; Williamson 1782). New World military forts were frequently located on frontiers where demand exceeded available supplies and underdeveloped local infrastructure impeded the delivery of food and equipment. As a result, provisioning soldiers effectively in North America required alterations to standard European operating procedures (Cubbison 2010). Provisions were transported to frontier fortifications by boat where navigable rivers and lakes were available, wagon where road systems were developed, and pack horses where backwoods conditions impeded wagon travel (Forbes 1758b, c, d). Cattle were also herded to fortifications, or with marching armies, to reduce the number of wagons and horses needed for transport. Furthermore, the British Army and Colonial Assemblies took a variety of actions to achieve a degree of self-sufficiency at frontier fortifications. Between 1760–1761 General Gage ordered that gardens be planted at frontier forts to provide a more reliable source of greens (Dunbar 1760; Gladwin 1761). Breweries were established at some forts to produce spruce beer, an important source of vitamin C necessary to stave off scurvy (Kopperman 2007; Cubbison 2010). Attempts were made to keep herds of livestock at frontier fortifications (Breitburg 1983; Coe 2006), and hunting was encouraged when conditions allowed (Antony 1972). Despite these actions, shortages were frequent, and deliveries of spoilt meat and vegetables were common (Anderson 1984; Beattie 1986; Parker 1970). The French and Indian, or Seven Years’, War was one of many conflicts between New France and the British colonies in eastern North America during the 18th Century. Conflict in North America centered over control of economically valuable North Atlantic fishing grounds and fur trade opportunities in the Ohio River Valley. In the years leading up to the French and Indian War, France suffered a series of losses on both fronts. The Treaty of Utrecht, which ended the War of Spanish Succession (1701–1714), forced France to cede colonies in Newfoundland and mainland Nova Scotia to the British, and with them the settlements closest to the Grand Banks cod fisheries (Boscawen 2011). At the same time, British Indian traders severely limited French access to fur trade in the Ohio River Valley (Wainwright 1965). The French constructed a chain of forts from the Great Lakes south to the Allegheny River between 1752 and 1753 to challenge British dominance in the region (Wainwright 1965). Virginia Governor Dinwiddie dispatched George Washington, then an adjutant in the Virginia Colonial Militia, to establish British claims to the territory and prevent further strengthening of French sympathy in the area in 1753 (Wainwright 1965). In February 1754, Washington, now a lieutenant colonel returned to the Ohio territory to construct a fort at the confluence of the Ohio and Allegheny rivers. The arrival of a larger French force in April forced Washington to abandon the site and retreat forty miles southeast where he constructed Fort Necessity (Wainwright 1965). On May 28, 1754 Washington ambushed a small detachment of 35 French soldiers under the command of French military officer Joseph Coulon de Jumonville who died in Washington’s custody after the skirmish ended (Wainwright 1965). Washington was forced to surrender Fort Necessity on July 4th when a larger French army arrived seeking retribution for the death of Jumonville (Wainwright 1965). Though Britain and France did not officially declare war until 1756, Washington’s ambush of Jumonville is often considered the start of the French and Indian War. The British army recognized the value of Colonial soldiers familiar with the American wilderness and backwoods fighting was recognized early in the war and made use of both colonial “rangers” and Indian traders as light infantry, scouts, and guides. One of these, George Croghan, accompanied Washington on his excursion into the Ohio Territory in 1753 and provisioned Fort Necessity until Washington’s surrender on July 3, 1754 (Wainwright 1965). Following Washington’s surrender, Croghan retired to a camp on the Aughwick Creek in Pennsylvania seeking refuge from his creditors. A party of 200 allied Ohio Mingo lead by the Half King established the village of Aughwick Old Town 100 meters west of Fort Shirley (Spittler 2014; Wainwright 1965; Volwiler 1926). In 1755 General Braddock requested that two roads be constructed, one north and west from Fort Cumberland in what is today Maryland towards the French position at Fort Duquesne, the other west from the Susquehanna River in Pennsylvania (Volwiler 1926, Figure 1). Governor Morris of Pennsylvania charged Croghan with surveying a route from Shippensburg west to Fort Duquesne (Volwiler 1926). Croghan and his party headed west from Carlisle on March 29th 1755 following an old Indian trail along the Raystown Branch of the Juniata River before striking west (Volwiler 1926). Croghan’s team surveyed to within 18 miles of the Youghiogheny River before a French scouting party forced them to retreat to Fort Cumberland (Volwiler 1926). Croghan and allied Mingo warriors from Aughwick Old Town joined General Braddock’s expedition to dislodge the French from Fort Duquesne in the summer, returning to Aughwick after Braddock’s defeat by a combined French/Native American army near the Monongahela River on July 9th (Rouvalis 2013; Wainwright 1965; Volwiler 1926). Map of the road systems and placement of British frontier fortifications during the French and Indian War. Over the fall of 1755 Croghan fortified his camp at Aughwick with a palisade and outfitted 40 militiamen at his own expense (Campbell 2009; Wainwright 1965; Volwiler 1926). On December 9th Croghan was commissioned a captain in the Pennsylvania militia, and tasked with raising local militia and building three defensive forts in western Pennsylvania to supplement Croghan’s fortified camp which was rechristened Fort Shirley (Wainwright 1965; Volwiler 1926). Croghan became Sir William Johnson’s Deputy Indian Agent in March of 1756. Command of Fort Shirley passed to Captain Hugh Mercer (Wainwright 1965). Under Mercer’s command Fort Shirley served as the advance staging point for General Armstrong’s successful raid on the Ohio Delaware village of Kittanning in August of 1756. Fort Shirley was decommissioned soon after the raid when General Armstrong declared the site indefensible, and retreated to a new line of fortifications to the east (Volwiler 1926). Brigadier General John Forbes was assigned the task of leading the next British campaign to capture Fort Duquesne in March of 1758. Despite pressure from his colonial allies to employ the same road used by Braddock in 1755, Forbes selected a more northern route following existing roads to Carlisle and Shippensburg, Pennsylvania, proceeding from there to Fort Loudoun (PA), then to Ray’s Town (Bedford, PA) on unfinished roads constructed following the route surveyed by Croghan during Braddock’s campaign (Cubbison 2010; Volwiler 1926). From Bedford onwards Forbes’ army constructed its own road west to Fort Duquesne (Cubbison 2010). This strategy was slower than employing existing roads used by Braddock in 1755 because it required widening existing tracks and improving the grade of roads, but allowed Forbes to establish or improve existing frontier fortifications as both supply depots and defensive works should retreat be necessary. Croghan continued to act as an intermediary between the English and Native American allies in Pennsylvania, and is mentioned repeatedly in Forbes’ correspondence over the course of the campaign (e.g., Forbes 1758d, e, f, g, h, i, j). Forbes captured Fort Duquesne on November 26, 1758 after the French garrison burned and abandoned the site under cover of darkness (Cubbison 2010). The site was renamed Fort Pitt and remained in use through the American Revolutionary War. Archaeological excavation revealed Fort Shirley to be a bastioned, roughly 50 × 44 meter, rectangular fortification containing two large hearth features and several structures supported on horizontal log sills (Burns, Drodnock & Smith 2010; Rouvalis 2013; Spittler 2014), reflecting a map of the area in 1762 (recreated in Africa 1883). Palisade posts were rooted in a construction trench except where shallow limestone bedrock deposits in the southwest corner forced Croghan to excavate a builder’s trench. The faunal assemblages recovered from Fort Shirley (n = 5985) and Augwick Old Town (n = 87) were collected using 1/4th inch screens for general excavation units and 1/16th inch screens for feature fill. Faunal material was identified to the lowest possible taxonomic category through direct comparison to comparative specimens and relevant atlases (Brown and Gustafson 1979; Hillson 2005; Gilbert 2003). Number of Identified Specimens (NISP) and Minimum Number of Individuals (MNI) counts were tabulated for Fort Shirley taking into account epiphyseal fusion data (Silver 1969). Data from this analysis are openly accessible in the Penn State Scholarsphere Data repository (http://scholarsphere.psu.edu). The assemblage is curated at the Juniata College Cultural Research Institute. Faunal data from additional French and Indian War fortifications were assembled from published and unpublished reports for comparison (Table 2, Figure 2). Attempts were made to make this dataset as large as possible; however, only French and Indian War sites with complete lists of identified species were included. Where possible, additional criteria were used to further refine the dataset for this analysis. For example, only the material attributed to the permanent occupation of Fort Loudoun (TN) was used, since this is believed to more accurately represent the diet of soldiers dependent upon the state of local infrastructure than those present during the site’s construction who brought provisions and equipment to the site with them (Breitburg 1983). Similarly, though a series of analyses have been performed at Fort Michilimackinac (e.g., Carlson 2012; Cleland 1970; Scott 1985; Shapiro 1978), only Shapiro’s (1978) analysis is thought to reflect the diet of British foot soldiers (see Scott 1985). Historic maps (Anderson 1959; Brownell 1943; Dollerhide 1997; Lacock 1914; Thomas 1776; Volwiler 1926) were used reconstruct provisioning networks and assess an individual site’s accessibility as a factor of roads, navigable river systems, and degree of urbanization. We expect these variables to have influenced provisioning reliability. Based on these spatial variables, we constructed three analytical groups: urban, accessible, and isolated. List of sites with faunal data included in this analysis. Location of sites with faunal data included in this analysis (numbering follows order in Table 2). Urban sites are expected to have enjoyed direct access to local farmland and livestock herds made possible by established and maintained infrastructure, and well mapped transportation routes (Jolly 2013). The St. Louis Bastion in Quebec City, Quebec (Balkwill and Cumbaa 1987) and Fort Loudoun in Winchester (VA, Clark 2003) were located in urban settings and are placed in this grouping. Forts Hunter, Loudoun (PA), Frederick, Ligonier, Ashby, and Stanwix, and Ligonier were located away from urban centers, but on supply lines that likely increased the reliability of provisioning to sites and together form the “accessible” group. Forts Hunter and Ligonier were constructed on farmland settled prior to the outbreak of hostilities, and subsequently improved by Forbes as supply depots and frontier defenses (Dalton 2011; Webster 1982). Fort Ligonier was constructed during Forbes 1758 campaign to capture Fort Duquesne (Grimm 1970). Fort Ashby was located close Fort Frederick and the road Braddock constructed during his failed 1754 campaign, a road that remained important for supply and troop movements during Forbes’ campaign. Fort Stanwix defended an important portage between the Hudson and Mohawk rivers in New York and was connected to supplies by both the Hudson River and the Oneida Carry, a key road system. Forts Shirley, Loudoun (TN, Breitburg 1983), and Michilimackinac (Shapiro 1978) were isolated by their frontier locations and underdeveloped infrastructure and are grouped together into the “isolated” group. Fort Shirley was located in western Pennsylvania at a site occupied by Croghan as early as 1754. Though located along a well-known trade route used by traders like Croghan (Volwiler 1926), its location in the ridge and valley section of Pennsylvania was north of any surveyed road and far from any major navigable river would have inhibited the delivery of supplies. Fort Loudoun (TN) was constructed in Tennessee to counter the construction of French Fort Toulouse in Alabama, and was located 100 miles from the nearest garrison from which supplies were sent (Breitburg 1983). Fort Michilimackinac, constructed in 1713 at the northern tip of Michigan as a base for French fur trade enterprises, was occupied by the English in 1761 and held for the remainder of the French and Indian War (Cleland 1970). Despite its location on a major waterway, Fort Michilimackinac suffered from shortages in supply resulting from difficulties in transporting provisions up the French-held Saint Lawrence River, and across the Great Lakes (Cleland 1970; Scott 1985). Number of Identified Specimen (NISP) and Minimum Number of Individuals (MNI) data were the only measures widely available in the published sources and therefore serve as the units of measure in this analysis. ANOVA analysis performed in R was used to test for correlations between site accessibility and the abundance of domestic livestock recorded in faunal assemblages. The relative percentage of the total assemblage comprised by domestic livestock and key individual species (%NISP; %MNI) were used as measures of species’ dietary importance. Since NISP values were not available for Fort Stanwix (Hanson and Hsu 1975), it was included only in MNI-based calculations. Finally, the Simpson’s Diversity and Evenness was calculated in PAST to assess species diversity and the abundance of those species relative to others at individual sites as a further investigation of dietary patterning in this dataset. Historic documentation indicates that French and Indian War soldiers were provisioned with daily meat rations composed largely of beef and pork (Anderson 1984; Beattie 1986; Knox 1769; Parker 1970). Domestic livestock are expected to be more abundant in faunal assemblages from forts located in developed areas or accessible by roads and navigable rivers and lakes, than those which are hard to reach. To test whether the abundance of domestic livestock in the diets of soldiers at French is influenced by site accessibility, faunal material from Fort Shirley was analyzed (Table 3) and integrated into a dataset of French and Indian War fortifications (Tables 2 and 4). ANOVA analysis was used to test for statistically significant differences in the abundance of domestic livestock on forts associated with developed infrastructure and reliably navigable rivers, and those which were not. Taxa Identified in the Fort Shirley and Aughwick Old Town Assemblages. The total size of assemblages used in this analysis in identified NISP and MNI, and the dietary contribution of important species calculated as a percent of the assemblage identified to species. 1Based on NISP and MNI identified to species, see reports for total NISP and MNI. A total of 453 fragments were identifiable to family, genus, or species levels (Table 3). White-tailed deer (Odocoileus virginianus) make up 50.11% of the Fort Shirley assemblage. A total of 28.77% of faunal remains were of domestic livestock, of which cattle comprised (77.86%, n = 102), followed by pig (20.61%, n = 27). Horse, sheep, black bear, beaver, dog, opossum, one turkey, and one member of the skunk family, turtle, and several highly friable pieces of unidentified freshwater mussel are represented in the assemblage, but by relatively few elements. Though chickens or other domestic fowl may be present, the assemblage of bird bone from Fort Shirley is heavily fragmented and none were identified to species. A total of 59 fragments identified as domestic dog were recovered from a single feature and likely represents the intentional burial of one individual. Measurements taken on the distal end and shaft of a radius was used to generate a minimum shoulder height of 60.09 cm (Harcourt 1974), approximately the size of a modern large German shepherd. Epiphyseal fusion data indicate deer ranged in age from less than 5 months to over 3 years, with the majority around 2.5 years (Purdue 1983). Similarly, cattle butchered at Fort Shirley were between 3.5 and 5 years of age (Silver 1969). Pigs were likely younger than 3.5 years when they were slaughtered (Silver 1969). No age estimates were calculated for the single horse and sheep specimens. Only 48 fragments could be identified to species from material recovered from Aughwick Old Town, the Mingo Seneca refuge village constructed west of Croghan’s fort (Table 1). White-tailed deer again comprise the largest single contributor to the assemblage (66.67%, n = 32 elements). Age estimates based on a sample of nine epiphyseal fusion sites suggest the average age at death was again 2.5 years (Purdue 1983). Black bear, elk, turkey, turtle, and squirrel were also identified. No domestic livestock were identified in the Aughwick Old Town assemblage. 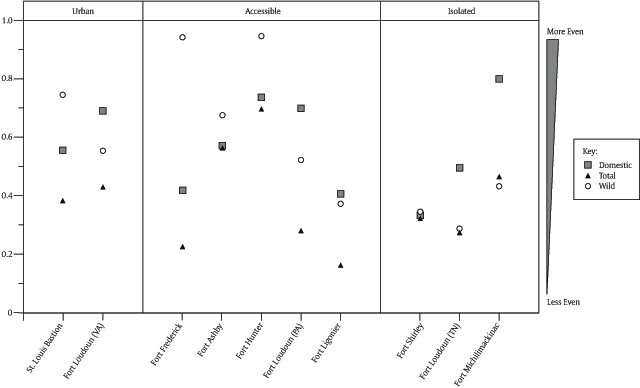 Domestic livestock comprise 80% or more of reported faunal assemblages from urban and accessible sites, but noticeably less in those from isolated sites (Figure 3). ANOVA analysis reveals no statistically significant differences between the contribution of domestic livestock to urban and accessible fortifications (%NISP: a = 0.05, F = 1.792, p = 0.238, %MNI: a = 0.05, F = 2.861, p = 0.142). Though these results suggest fortifications located in urban settings and along established supply lines maintained the expected domesticate based diet recorded in historical documents, our investigation of assemblage composition reveals differences in the way this diet was achieved. Sites located in urban centers drew heavily from both cattle and pigs, while frontier fortifications accessible via established supply lines tended to rely more heavily on cattle alone (Table 4). Differences in these dietary compositions may result from the means by which domesticates were delivered to sites. Though cattle were commonly herded along supply lines to be slaughtered at frontier fortifications in order to accommodate poor road and frontier conditions, pigs were generally delivered barreled and salted. As a result, when supply lines were poorly developed and supplies difficult to transport, live animals may have been preferred. Percent of the Number of Identified Specimens (NISP; black) and Minimum Number of Individuals (MNI; white) composed of domestic livestock on isolated and accessible fortifications included in this analysis. In contrast, domestic livestock contributes less than 60% of the assemblage at all isolated sites, and less than 30% in two of the three sites in this grouping. ANOVA analysis reveals statistically significant differences when isolated sites are compared with either urban (%NISP: a = 0.05, F = 14.4, p = 0.032, %MNI: a = 0.05, F = 20.15, p = 0.021), or accessible sites (%NISP: a = 0.05, F = 24.97, p = 0.002, %MNI: a = 0.05, F = 23.18, p = 0.002). Within isolated sites, domestic livestock contributed almost twice as much to the diet of Fort Loudoun (TN) than other sites in the isolated grouping. Elevated levels of domesticated livestock in the Fort Loudoun (TN) assemblage are made possible by relatively high contributions of both cattle and pigs which may have resulted from attempts to establish a breeding herd of cattle at the site and consumption of pigs purchased locally from the Cherokee (Breitburg 1983). ANOVA comparison of %NISP and %MNI cattle reveals no significant differences when compared with urban sites (%NISP: a = 0.05, F = 3.226, p = 0.17, %MNI: a = 0.05, F = 5.78, p = 0.096), but significant differences when compared to accessible sites (%NISP: a = 0.05, F = 30.37, p = 0.002, %MNI: a = 0.05, F = 20.81, p = 0.003). This pattern is reversed for %NISP when comparing pigs to urban (%NISP: a = 0.05, F = 28.76, p = 0.013, %MNI: a = 0.05, F = 50.98, p = 0.006) and accessible sites (%NISP: a = 0.05, F = 0.468, p = 0.52, %MNI: a = 0.05, F = 3.145, p = 0.119). As shown in Table 4, these statistical differences result from differences in how urban and accessible fortifications achieved prescribed, domesticate reliant diets. Urban sites relied upon cattle and pigs to contribute roughly equal proportions of their diet. In contrast, accessible sites relied almost entirely upon cattle to fulfill their dietary needs. Together these results suggest that pigs were most heavily relied upon when a local source was available, and under these conditions, were used to offset reliance on cattle. Simpson’s diversity and evenness indices provide a means of further investigating the diversity and distribution of species in an assemblage. The Simpson’s diversity index measures species richness, or number of species in an assemblage relative to the assemblage’s size. Values close to one represent high diversity (more species) while values close to zero represent low diversity (fewer species). By comparing diversity indices generated for the wild game and domestic livestock components of each assemblage to the diversity index generated for the total assemblage, we can see how important wild or domestic species are to total assemblage diversity. 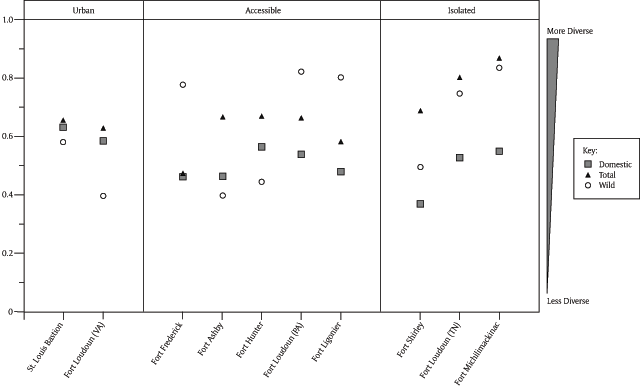 In isolated sites, the diversity indices for wild game cluster with the diversity indices for the total assemblage (Figure 4). This indicates that the diversity of the total assemblage is driven largely by the wild game consumed by soldiers. In the case of the urban sites, wild game diversity is much lower and instead these sites exhibit very similar domestic livestock and total assemblage diversity indices (Figure 4). This difference indicates that relatively few wild species were present and that they had minimal impact on the diversity of urban assemblages. Finally, accessible sites exhibit elevated wild game diversity than seen at urban sites but still show relatively similar domestic and total assemblage diversity indices. This suggests that assemblage diversity at accessible sites was driven largely by domestic livestock despite more wild game species having been included. Simpson’s Diversity Indices for the total assemblage, domestic livestock, and wild game in assemblages used for this analysis. Simpson’s evenness index complements patterns exhibited by diversity indices by revealing how evenly species are represented in an assemblage. Values close to one indicate that equal numbers of all species are present, while values close to zero indicate that some species are more common than others (Figure 5). 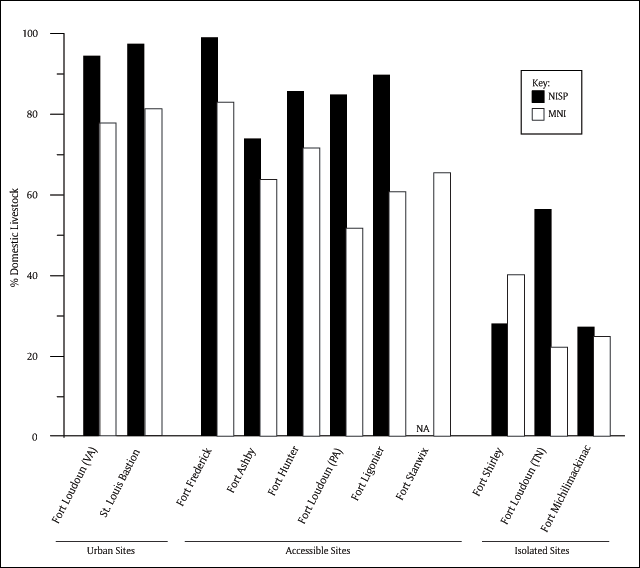 Separate indices calculated for NISP domestic livestock, wild game, and total assemblage evenness reveal relatively even wild game evenness in urban sites, but highly uneven species representation in isolated ones (Figure 5). Highly uneven wild game indices at isolated sites may indicate increased selectiveness in hunting efforts as one or several species were selectively targeted. Results for domestic livestock show that domestic species are more equally represented in urban assemblages than at accessible sites (see Table 4) suggesting that cattle were preferentially used in provisioning sites located along supply lines but distant from any nearby agricultural availability. Simpson’s Evenness Indices for the total assemblage, domestic livestock, and wild game in assemblages used in this analysis. Domestic livestock contributed significantly to the diet of soldiers stationed at many French and Indian War fortifications included in this study, supporting expectations derived from historic military manuals (Guilday 1970; Webster 1982). However, the ratio of species consumed varied depending upon site location and accessibility. The diets of soldiers stationed at French and Indian War fortifications were influenced by a diversity of factors relating to site’s accessibility by roads, rivers, lakes, and the proximity and development of local food producing communities. The meat soldiers consumed is known to have come from one of three sources: salted or smoked meat transported to the site; live animals herded to or raised on site; or wild game hunted locally by soldiers or their Native American allies (Breitburg 1983; Cubbison 2010; Guilday 1970; Parker 1970). Assessing the importance of these options to the diet of soldiers using archaeological data remains challenging. At least some of the meat consumed by French and Indian War soldiers was delivered in the form of salted and barreled pork (Cubbison 2010). Archaeologists have attempted to devise methods of identifying when barreled meat was used (e.g., Brophy & Crisman 2013). These methods have been recently formalized by Tourigny (2017) who relies upon a combination of element presence, and cut-mark placement. Unfortunately, these data were not available for many of the sites used in this analysis. Furthermore, documentary evidence suggests that almost perpetual maintenance was required to ensure that roads remained passable, and wagons were for transporting barreled goods were in short supply (Forbes 1758i, k, l, m, n) suggesting that other means were needed to reliably provision frontier garrisons. Forbes adapted to the poor road conditions and shortages in wagons during his 1758 campaign by using pack horses and herding live animals to sites for slaughter (Cubbison 2010; Forbes 1758a; Hoops 1758; Mercer 1758). Forbes (1758a) indicates that by July of 1758 his troops were being provisioned largely with live cattle. Forbes (1758g, o) indicates that cattle were kept at his supply forts and herded along with the army where forage could be found. Herding live animals to forts had many advantages. Large herds of livestock, as many as 200 (Hoops 1758), could be guarded by fewer soldiers than were required for comparable numbers of pack horses or wagons and did not require packaging in barrels (Cubbison 2010). However, herding livestock over long distances came at the cost of lost body mass, leading to frequent complaints about the poor quality of livestock arriving at fortifications (Breitburg 1983; Guilday 1970). When forage began to fail later in the campaign, Forbes had a smokehouse constructed at Loyalhanna so that cattle could be slaughtered and preserved, possibly suggesting salt and barrels were not available (Forbes 1758p). Losses in meat following on-site butchery were not uncommon due to insufficient supplies of salt or barrels for preserving slaughtered animals (Breitburg 1983; Parker 1970). Complaints regarding shipments of rancid pickled and salted pork and beef document these shortages (Breitburg 1983; Cubbison 2010; Parker 1970). The presence of phalanges, carpals, and tarsals in assemblages has been used as evidence for onsite butchery of cattle and pigs (Guilday 1970; McBride 2013) and may suggest that live animals were slaughtered at Fort Shirley, Ligonier (Guilday 1970) and Fort Loudoun (PA) (Webster 1982). Further, commissaries charged with provisioning frontier fortifications are known to have preferred prime age adult cattle. Though age estimates were not available for many sites, existing data indicate that prime age adults between 2.5 and 4 years of age comprise well over 65% percent of cattle at Fort Loudoun (PA) (Webster 1982). In contrast, cattle under 12 months of age make up as much as 45% of the cattle slaughtered for the garrison of the St. Louis Bastion in Quebec City (Balkwill and Cumbaa 1987). King (1984) identified similarly elevated numbers of prime age cattle slaughtered at Roman frontier fortifications, and reliance on old and young individuals in urban garrisons. Balkwill and Cumbaa (1987) suggest this pattern may indicate consumption of unnecessary male calves from local herds. Notably, King (1984) also highlights the dominance cattle at Roman frontier fortifications in comparison to more equivalent reliance on pigs and cattle in urban centers –a pattern similar to that identified here between urban and accessible sites. Taken together, these data may suggest that roughly equal numbers of cattle and pigs, and consumption of elevated numbers of young and old cattle may be indicators that herds exist within the vicinity of military garrisons. In contrast, large quantities of wild game consumed at Forts Shirley, Loudoun (TN) and Michilimackinac indicate a deviation from this general pattern, likely related to these sites’ relative isolation. Wild game comprises 76.85% (n = 435 NISP, 70.37% MNI) of the identified material recovered from Fort Shirley, supporting statements about the lack of provisions in 1755 correspondence between Croghan and James Hamilton of the Pennsylvania Colonial Government (Wainwright 1965). Limited access to supplies and equipment also meant that many of the 40 men Fort Shirley and other western forts were armed with Croghan’s own rifles rather than smoothbore muskets issued by the Colonial government (Wainwright 1969). Review of the historical literature reveals substantial documentary evidence of insufficient supplies at other French and Indian War fortifications including Fort Loudoun (TN, Breitburg 1983). These were isolated by the distance to supply depots and the lack of maintained roads or navigable rivers for supply delivery. Though Cleland (1970) believed that supply lines were far more reliable during the British occupation of Fort Michilimackinac than the earlier French occupation, French and Indian War soldiers stationed at the site would likely have been provisioned by boats which had to traverse a series of rivers and the Great Lakes to deliver supplies. The sheer distance over which provisions had to be transported may have isolated Fort Michilimackinac (Cleland 1970) and led to shortages in domestic livestock and other supplies. Inconsistent support from colonial assemblies at frontier locations like Fort Shirley and the unreliability of supply lines recorded in Croghan’s journals and personal communication (Wainwright 1965) likely encouraged hunting. Antony (1972) suggests soldiers in 18th century armies faced with unreliable supply lines were often encouraged to hunt; however, relatively little is known of the methods soldiers employed and such activities could be risky. Soldiers who strayed too far from the safety of the fort were occasionally captured or killed and the practice was occasionally banned during periods of open hostility (Guilday 1970; Parker 1970). John Baker, Croghan’s indentured servant, was captured from a garden close to Fort Shirley in 1756, and hostile Delaware warriors are known to have frequented the area in hopes of capturing Croghan (Wainwright 1965). As a result of frequent Native American raids many contractors tasked with delivering provisions to frontier fortifications refused to deliver supplies without protection from the forts. To accomodate this, frontier garrisons were forced to forgo scouting, offensive actions, and potentially hunting activities, to defend their own supply convoys (Wainwright 1965). Relations with local Native American groups may have significantly influenced the lives of soldiers, including through the contribution of wild game to diets. Forbes noted on July 10th, 1758 (1758q) that his Cherokee allies contributed provisions to the British army’s stores. Native American hunting may have been especially important to the garrisons of isolated fortifications facing unreliable provisioning by traditional measures. Close association between Fort Shirley and Aughwick Old Town likely encouraged cooperation between the inhabitants for protection and survival, and may have allowed Croghan and his soldiers to rely on native hunters for some of their provisions (Wainwright 1965). Intermarriage between Croghan’s militia, and European trade beads, copper tinkle cones, and triangles recovered from Fort Shirley and Aughwick Old Town may be evidence of cooperation between the occupants of the sites. Though no domestic livestock were identified in the Aughwick Old Town assemblage (Table 3), the Pennsylvania colonial government is known to have provided food for Aughwick Old Town in the autumn and winter of 1754 (Sipe 1930), and may have supplemented expenses incurred by Croghan in providing for the Native Americans through his tenure in command (Wainwright 1965). Relations with the Mingo-Seneca changed after Hugh Mercer took command of Fort Shirley leading to the dissipation of the Mingo-Seneca community (Wainwright 1965). If this is the case, declining Native American aid following Mercer’s arrival may have contributed to Fort Shirley’s abandonment as provisioning of the site became increasingly untenable. Though wild game was significantly less abundant at other isolated sites examined in this analysis than at Fort Shirley, unconventional sources including Native allies may have been equally important to their provisioning. Relatively high contributions of pig, and possibly deer, at Fort Loudoun (TN) likely resulted though meat purchased directly from the Cherokee (Breitburg 1983). Deer are conspicuously absent at Fort Michilimackinac, a fact Martin (1991) attributes to the rarity of deer in mixed conifer-deciduous forest of northern Michigan. Soldiers at Michilimackinac appear to have integrated fish and other small game species into their diet in place of these larger species (Shapiro 1978). Notably, however, the apparent absence of fish and other small species from other sites may result from taphonomic processes or recovery technique (Jones and Gabe 2015; Nagaoka 2005; Shaffer 1992). Unfortunately, few sites in this analysis provided information regarding recovery technique, and it was not possible to effectively test the effects of screening on assemblage size or diversity. Statistical comparisons performed in this analysis highlight substantial differences in soldiers’ reliance on domestic livestock that were linked to site accessibility. Similar dietary patterns attributed to craft specialization and the production of agricultural surpluses have been identified between rural and urban populations elsewhere (Albarella 2005; Landon 1996; Reitz 1986). Case studies examining military provisioning systems provide valuable avenues of research for several reasons. First, military bureaucracy resulted in the accumulation of detailed documentary records that can be drawn upon when formulating hypotheses, tracking provisioning routes and methods. Second, public interest has driven the identification and study of many contemporary sites enabling archaeological evaluation of system efficiency. From these sources, we know that 18th century British and Colonial soldiers were provisioned with comparable quantities of meat, flour, vegetables, alcohol, and other provisions (Knox 1769; Parker 1970). Deviation from these dietary patterns appears to indicate a breakdown in military provisioning systems associated with under-developed supply lines. Finally, frontier military action drove the development of frontier towns, often located around forts and along road systems constructed to facilitate the delivery of garrison provisions (Mayer 2006). Comparison of dietary patterning between military and civilian diets in developing frontier towns, and between civilian communities on the frontier and established urban centers further east, may prove enlightening and help characterize the agricultural, economic, and environmental shifts in early American colonial history. Thanks are due to Penn State undergraduate students Kristi Bartolome, Grace Bratlee, Paige Lynch, and zooarchaeology lab volunteer Joanne Hughes in addition to the staff and students of the Penn State Archaeological Field School (2009–2014). We would also like to thank Terrance Martin (Illinois State Museum), Chantal Dussault (Canadian Museum of Nature), and the many others who provided copies of unpublished reports employed in this analysis. Africa, JS. 1883. History of Huntingdon County, Pennsylvania. Huntingdon, PA: Huntingdon County Historical Society. Albarella, U. 2005. Meat Production and Consumption in Town and Country. In: Giles, K and Dyer, C (eds. ), Town and Country in the Middle Ages: Contrasts, Contacts, and Interconnections, 131–148. Leeds: Maney Publishing. Anderson, F. 1984. A People’s Army: Massachusetts Soldiers and Society in the Seven Years’ War. Chapel Hill, NC: University of North Carolina Press. Anderson, N. 1959. The General Chooses a Road. The Western Pennsylvania Historical Magazine, 42(2): 109–138. Antony, B. 1972. Life in Wellington’s Army. Brighton, UK: Tom Donovan. Balkwill, D and Cumbaa, SL. 1987. Salt Pork and Beef Again? The Diet of French and British Soldiers at the Casemate, Bastion St. Louis, Quebec. Research Bulletin 252, Environment Canada, Parks. Report on file at the Canadian Museum of Nature. Bannerman, G. 2004. Merchants and the Military in Eighteenth-Century Britain: British Army Contracts and Domestic Supply, 1739–1763. Unpublished thesis (PhD), King’s College London. Beattie, D. 1986. The Adaptation of the British Army to Wilderness Warfare, 1755–1763. In: Ultee, M (ed. ), Adapting to Conditions: War and Society in the Eighteenth Century, 56–83. Tuscaloosa, AL: University of Alabama Press. Boscawen, H. 2011. The Capture of Louisbourg, 1758. Norman: University of Oklahoma Press. Breitburg, E. 1983. Bone Discardment Patterns and Meat Procurement Strategies at British Fort Loudoun (Tennessee), 1756–1760. Unpublished thesis (MA), Vanderbilt University. Brown, CL and Gustafson, CE. 1979. A Key to the Postcranial Skeletal Remains of Cattle/Bison, Elk, and Horse. Laboratory of Anthropology Reports of Investigations 57. Pullman: Washington State University. Brownell, EE. 1943. Map of Mohawk Country: From 1690 to 1790. Philadelphia, PA. Reproduced by E. E. Brown. Burns, JA, Drobnock, GJ and Smith, JM. 2010. Croghan at Aughwick: History, Maps, and Archaeology Collide in the Search for Fort Shirley. Pioneer American Society Transactions, 33: 14–31. Campbell, WJ. 2009. An Adverse Patron: Land, Trade, and George Croghan. Pennsylvania History: A Journal of Mid-Atlantic Studies, 76: 117–140. Carlson, JK. 2012. Culinary Creolization: Subsistence and Cultural Interaction at Fort Michilimackinac, 1730–1761. Archaeological Completion Report Series 18. Mackinac Island, MI: Mackinac Island State Park Commission. Clark, DT. 2003. An Analysis of Faunal Remains from Fort Loudoun (44FK593), a French and Indian War Period Site. Report Prepared for the Virginia Department of Historic Resources. Winchester, VA: Regional Preservation Office. Cleland, CE. 1970. Comparison of the Faunal Remains from French and British Refuse Pits at Fort Michilimackinac: A Study in Changing Subsistence Practices, 3: 8–23. Canadian Historic Sites: Occasional Papers in Archaeology and History. Coe, MD. 2006. The Line of Forts Historical Archaeology on the Colonial Frontier of Massachusetts. Lebanon, NH: University Press of New England. Cubbison, D. 2010. The British Defeat of the French in Pennsylvania, 1758. Jefferson, NC: McFarland and Co.
Dalton, EC. 2011. Faunal Analysis at Fort Hunter: A French and Indian Supply Fort in Pennsylvania. Unpublished thesis (BA hons), Franklin and Marshall College. Dollerhide, W. 1997. Map Guide to American Migration Routes, 1735–1815. Bountiful, UT: Heritage Quest. Dunbar, W. 1760. Letter to Gen. Thomas Gage, 15 March. In: The Thomas Gage Papers. Ann Arbor, MI: Clements Library. Forbes, J. 1758a. Letter to Lt. Col. Henry Bouquet, July 14. In: Procter, JA (ed. ), Writings of General John Forbes relating to his service in North America, 1938. Menasha, WI: The Collegiate Press. Forbes, J. 1758b. Letter to Lt. Col. Henry Bouquet, May 29. In: Procter, JA (ed. ), Writings of General John Forbes relating to his service in North America, 1938. Menasha, WI: The Collegiate Press. Forbes, J. 1758c. Letter to Bouquet, June 27. In: Procter, JA (ed. ), Writings of General John Forbes relating to his service in North America, 1938. Menasha, WI: The Collegiate Press. Forbes, J. 1758d. Letter to Gen. James Abercrombie, July 9. In: Procter, JA (ed. ), Writings of General John Forbes relating to his service in North America, 1938. Menasha, WI: The Collegiate Press. Forbes, J. 1758e. Letter to Lt. Col. Henry Bouquet, September 2. In: Procter, JA (ed. ), Writings of General John Forbes relating to his service in North America, 1938. Menasha, WI: The Collegiate Press. Forbes, J. 1758f. Letter to Gen. James Abercrombie, September 4. In: Procter, JA (ed. ), Writings of General John Forbes relating to his service in North America, 1938. Menasha, WI: The Collegiate Press. Forbes, J. 1758g. Letter to William Pitt, September 6. In: Procter, JA (ed. ), Writings of General John Forbes relating to his service in North America, 1938. Menasha, WI: The Collegiate Press. Forbes, J. 1758h. Letter to Gen. James Abercrombie, October 8. In: Procter, JA (ed. ), Writings of General John Forbes relating to his service in North America, 1938. Menasha, WI: The Collegiate Press. Forbes, J. 1758i. Letter to Lt. Col. Henry Bouquet, October 25. In: Procter, JA (ed. ), Writings of General John Forbes relating to his service in North America, 1938. Menasha, WI: The Collegiate Press. Forbes, J. 1758j. Letter to Lt. Col. Henry Bouquet, November 22. In: Procter, JA (ed. ), Writings of General John Forbes relating to his service in North America, 1938. Menasha, WI: The Collegiate Press. Forbes, J. 1758k. Letter to Gen. James Abercrombie, September 21. In: Procter, JA (ed. ), Writings of General John Forbes relating to his service in North America, 1938. Menasha, WI: The Collegiate Press. Forbes, J. 1758l. Letter to Lt. Col. Henry Bouquet, September 23. In: Procter, JA (ed. ), Writings of General John Forbes relating to his service in North America, 1938. Menasha, WI: The Collegiate Press. Forbes, J. 1758m. Letter to Gen. James Abercrombie, October 24. In: Procter, JA (ed. ), Writings of General John Forbes relating to his service in North America, 1938. Menasha, WI: The Collegiate Press. Forbes, J. 1758n. Letter to Lt. Col. Henry Bouquet, October 30. In: Procter, JA (ed. ), Writings of General John Forbes relating to his service in North America, 1938. Menasha, WI: The Collegiate Press. Forbes, J. 1758o. Letter to Gen. James Abercrombie, November 17. In: Procter, JA (ed. ), Writings of General John Forbes relating to his service in North America, 1938. Menasha, WI: The Collegiate Press. Forbes, J. 1758p. Letter to Joshua Howell, August 26. In: Forbes Headquarters Papers. University of Virginia Library, Charlottesville, Virginia. Forbes, J. 1758q. Letter to Lt. Col. Henry Bouquet, June 10. In: Procter, JA (ed. ), Writings of General John Forbes relating to his service in North America, 1938. Menasha, WI: The Collegiate Press. Gilbert, BM. 2003. Mammalian Osteology. Columbia, MO: Missouri Archaeology Society Inc.
Gladwin, H. 1761. Letter to Gen. Thomas Gage, May 24. In: The Thomas Gage Papers. Ann Arbor, MI: Clements Library. Grimm, JL. 1970. Archaeological Investigation of Fort Ligonier 1960–1965. Annuls of the Carnegie Museum 42. Guilday, JE. 1970. Animal Remains from Archaeological Excavations at Fort Ligonier. In: Grimm, JL (ed. ), Archaeological Investigation of Fort Ligonier 1960–1965, 177–186. Annuls of the Carnegie Museum 42. Hanson, L and Hsu, DP. 1975. Casements and Cannonballs, Archaeological Investigations at Fort Stanwix, Rome, New York. Publications in Anthropology 14. Washington, DC: Department of the Interior. Hoops, A. 1758. Letter to Col. H. Bouquet, June 17. In: Stevens, SK, Kent, DH and Roland, LJ (eds. ), The Papers of Henry Bouquet, 1941. Harrisburg: Pennsylvania Historical Commission. John Milner Associates. 1978. Fort Frederick: An Archaeological Investigation of the Southwest Bastion and Areas Exterior to the North and West Walls. Report prepared for the State of Maryland Department of Natural Resources. King, AC. 1984. Animal Bones and the Dietary Identity of Military and Civilian Groups in Roman Britain, Germany and Gaul. In: Blagg, TFC and King, AC (eds. ), Military and Civilian in Roman Britain, 187–217. Oxford: British Archaeological Reports. Knox, J. 1769. An Historical Journal of The Campaigns in North-America, for the Years 1757, 1758, 1759, and 1860: Containing The Most Remarkable Occurrences of that Period; Particularly The Two Sieges of Quebec, &c. &c. The Orders of the Admirals and General Officers; Descriptions of the Countries where the Author has served, with their Forts and Garrisons; their Climates, Soil, Produce; and A Regular Diary of the Weather. As Also Several Manifesto’s, a Mandate of the Late Bishop of Canada; The French Orders and Disposition for the Defence of the Colony, &c. &c. &c, 1. London: Johnston and Dodsley. Kopperman, PE. 2007. The British Army in North America and the West Indies, 1755–83: A Medical Perspective. In: Hudson, GL (ed. ), British Military and Naval Medicine 1600–1830, 51–86. New York: Editions Rodopi B. V.
Lacock, JK. 1914. Braddock Road. Pennsylvania Magazine of History and Biography, 38(1): 1–38. Landon, DB. 1996. Feeding Colonial Boston: A Zooarchaeological Study. Historical Archaeology, 30(1): i–vii, 1–153. Martin, TJ. 1991. An Archaeological Perspective on Animal Exploitation Patterns at French Colonial Sites in the Illinois Country. In: Walthall, JA (ed. ), French Colonial Archaeology: The Illinois Country and the Western Great Lakes, 189–200. Urbana: University of Illinois Press. Martin, TJ and Mallard, AM. 2008. Animal Remains from the Fort Ashby Site (46MI58), Mineral County West Virginia. Technical Report 2008-000-7. Springfield: Illinois State Museum. Mayer, HA. 2006. From Forts to Families: Following the Army into Western Pennsylvania, 1758–1766. The Pennsylvania Magazine of History and Biography, 130(1): 5–43. Mercer, H. 1758. Letter to Col. H. Bouquet, September 14. In: Stevens, SK, Kent, DH and Roland, LJ (eds. ), The Papers of Henry Bouquet, 1941. Harrisburg: Pennsylvania Historical Commission. Mudar, K. 1978. The Effects of Socio-Cultural Variables on Food Preferences in Early 19th-Century Detroit. Conference on Historic Site Archaeology Papers 1977, 12: 322–391. Parker, KL. 1970. Anglo-American Wilderness Campaigning, 1954–64: Logistical and Tactical Developments. Unpublished dissertation (PhD), Columbia University. Pippen, DS. 2010. For Want of Provisions: An Archaeological and Historical Investigation of the British Soldier at Fort Haldimand (1778–84). Unpublished dissertation (PhD), Syracuse University. Poirier, DA. 1976. Camp Reading: Logistics of a Revolutionary War Winter Encampment. Northeast Historical Archaeology, 5(12): 40–52. Rogers, H, Bartholomew, A and Armstrong, AK. 1998. Faunal Remains. In: Walker, DN (ed. ), Archaeology at the Fort Laramie Quartermaster Dump Area, 1994–1996, 213–231. Cultural Resource Selections Intermountain Region, National Park Service 13. Denver: National Park Service. Rouvalis, C. 2013. Commerce and Conflict on the 18th Century Frontier. American Archaeology, 17(3): 32–37. Scott, EM. 1985. French Subsistence at Fort Michilimackinac, 1715–1781: The Clergy and the Traders. Archaeological Completion Report Series 9., Mackinac Island, MI: Mackinac Island State Park Commission. Shapiro, G. 1978. Early British Subsistence Strategy at Michilimackinac: An Analysis of Faunal Remains from the 1977 Season. In: Heldman, DP (ed. ), Excavations at Fort Michilimackinac, 1977: House 1 of South Southeast Row House, 161–177. Archaeological Completion Report Series 2. Mackinac Island, MI: Mackinac Island State Park Commission. Silver, IA. 1969. The Aging of Domestic Animals. In: Bothwell, D and Higgs, E (eds. ), Science in Archaeology: A Survey of Progress and Research, 283–302. New York: Preager Publishers. Sipe, CH. 1930. The Principle Indian Towns of Western Pennsylvania. Western Pennsylvania History, 13(2): 104–122. Spittler, RS. 2014. A Geophysical Investigation: Locating the Native American Settlement at Fort Shirley. Unpublished thesis (MA), Indiana University of Pennsylvania. Sullivan, T. 1997. From Redcoat to Rebel: The Thomas Sullivan Journal. In: Lee, J (ed. ), Berwyn Heights, MD: Heritage Books. Thomas, J. 1776. Map of Pennsylvania Exhibiting not on the Improved Parts of that Province, but also its Extensive Frontiers: Laid down from Actual Surveys, and Chiefly from the Late Map of W. Scull Published in 1770; and Humbly Inscribed to the Honorable Thomas Penn and Richard Penn Esquires True and Absolute Proprietaries & Governors of the Province of Pennsylvania and the Territories thereunto belonging. London: Sayer and Bennett. Tokar, JR. 1999. Redcoat Resupply! 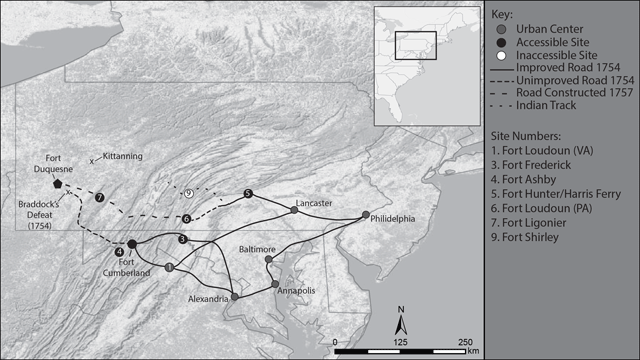 Strategic Logistics and Operational Indecision in the American Revolutionary War, 1775–1783. Monograph on file, Fort Leavenworth, KS: School of Advanced Military Studies, United States Army Command and General Staff College. Tourigny, ED. 2017. Eating Barrelled Meat in Upper Canada: Cultural and Archaeological Implications. International Journal of Historical Archaeology. Volwiler, AT. 1926. George Croghan and the Westward Movement, 1741–1782. Cleveland: Arthur H. Clarke and Co.
Wainwright, ND. 1965. George Croghan: Wilderness Diplomat. Chapel Hill, NC: University of North Carolina Press. Webster, G. 1982. An Analysis of Faunal Materials from the Well at Fort Loudoun, Pennsylvania. Report on file at the State Museum of Pennsylvania.